Specialized are well known in the cycling industry for producing high specification bikes for all ages, so it is no surprise that the Specialized Hotwalk Balance Bike is one of the best quality models available for toddlers and early riders. The Specialized Hotwalk Balance bike has been relaunched for 2019, with a redesigned frame and a longer wheelbase for more stable riding. 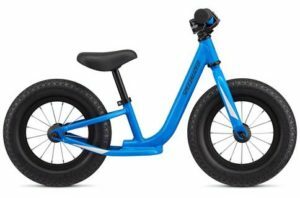 The Specialized Hotwalk Balance bike is highly recommended to be purchased for children from the age of 2 onwards, and the tough and rugged design should last riders of this age right through to their first pedal bike. The Specialized Hotwalk Balance Bike for 2019 now has a lower starting saddle height so it is suitable for children from 82cm in height. Another key feature is the step through frame, which makes the bike easier to access for younger children. This is a similar feature to some of the other great bikes for 2 year olds like the Puky LRM balance bike and the Weeride Deluxe. Specialized have previously offered different frames for boys and girls, but this has all changed for 2019 with a standard frame including the step through frame and a footrest. Younger children will also enjoy the footrest which comes in handy as they ride along. The Specialized Hotwalk Balance bike is one of the more expensive bikes we have reviewed at a price of £130, but this does include quality features such as a frame which is constructed from Specialized A1 Premium Aluminium which helps to keep the weight of the bike down. The bike also includes alloy rims and a Specialised Kid’s Henge padded seat for a comfortable ride. The tyres are Rhythm Lite Airless tyres so they will never get a puncture. Appearance wise, this bike looks top of the range with a stylish design that is available in a choice of green, blue, pink or red. Overall, this is a top quality balance bike which will last the test of time and will retain its value or can be passed down to friends and family. The Specialized Hotwalk balance bike is currently available for £130, but if you like the look of this bike but are working towards a smaller budget then check out the range of bikes from Puky or the Strider Classic Balance bike for £66.